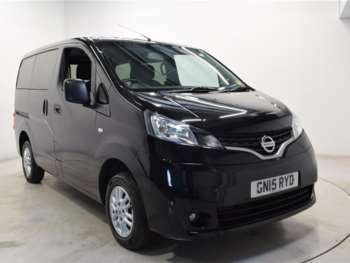 The Nissan NV200 is available for both commercial drivers and those who want to take the kids on holiday with a bucket load of luggage in the back. First unveiled as a concept back in 2007, the Nissan NV200 eventually made its debut in 2009 and won awards in its commercial guise from a number of publications. There are plenty of European equivalents in this category, but the Nissan NV200 brings Japanese reliability and practicality to the table whether you want it for work or everyday usage. On the outside, the NV200 is a fairly typical looking light van, with a chunky body and twin sliding doors on either side to allow easy access to the rear storage space or seating, depending on the model in question. Inside you can choose between five or seven seats if you go for the family-oriented NV200 Combi, while the van packs plenty of room to fit a variety of jobs. The interior is well built and deliberately designed to be able to withstand use in the commercial sector. As such it can deal with some real punishment and not end up tattered or shattered, which is good news for when the kids get rowdy. Standard kit includes CD player and electric windows, but if you want alloys, air con and a reversing camera, you'll need to look for the SE trim package, which also adds the seven-seater option. The diesel engine should deliver combined fuel consumption of 53mpg, and if you've got a lot of people or products to move about the place, you'll be hard pressed to find a vehicle that can achieve it for less. The driving experience is defined by the good position given to the driver and the well-designed wheelbase, which means that it is easy to manoeuvre this van in urban environments where space may be tight. It may have a smallish engine, but the power is delivered well and you won't feel like a used Nissan NV200 is lacking anything when compared with its better-endowed alternatives. The turning circle is also impressive, at just 11 metres, which means parking is also easier. Got a specific Nissan NV200 model in mind?